1. "I ask people why they have deer heads on their walls and they always say that it's because it's such a beautiful animal. You know, I think that my mother is beautiful, but I choose to have photographs of her on my wall." 2. "Nothing will benefit human health and increase the chances of survival of life on Earth as much as the evolution to a vegetarian diet." 3. "To get mud off your hands, use soap and water. To get blood off your hands, go vegan." 4. "Now I can look at you in peace. I don't eat you anymore." 5. "I brainwashed youngsters into doing wrong. I want to say sorry to children everywhere for selling out to people who make millions by murdering other living creatures." 6. "I don't want to eat anything that had a mother." 7. "If slaughterhouses had glass walls, everyone would be vegetarian." 7. "Unlike slaughterhouses and factory farms, greenhouses actually do have glass walls." 9. "Last year over a million people left the same suicide note... SHOPPING LIST: Butter, Eggs, Milk, Cheese, Beef, Chicken, and Bacon." 10. "We choose to eat meat and have therefore built slaughter houses for the animals and hospitals for us." 11. "Animal factories are one more sign of the extent to which our technological capacities have advanced faster than our ethics." 12. "If one person is unkind to an animal it is considered to be cruelty, but if a lot of people are unkind to animals (especially in the name of profit) the cruelty is condoned and will be defended by otherwise intelligent people." 13. "Animals give me more pleasure through the view-finder of a camera than they ever did in the cross-hairs of a gun sight, and after I've finished "shooting" them they are still around for others to enjoy." 14. "If you don't like seeing pictures of violence towards animals being posted, you need to stop the violence, not the pictures." 15. "Don't refuse with your eyes what the animals have to endure with their bodies so you can eat them." 16. "Once you come to terms with why you don't eat cats, dogs, and horses, you will begin to understand why I don't eat chickens, pigs, and cows." 17. "Teaching a child not to step on a caterpillar is as valuable to the child as it is to the caterpillar." 18. "On Thanksgiving families get together to celebrate one genocide (Against The Native Americans) by committing another genocide (Against Millions Of Turkeys)." 19. "Some people think a vegan diet is extreme, but you know, half a million people each year have their chests surgically opened up and then have a vein taken from their leg and sewn onto their coronary artery, and I would call that extreme." 20. "Ask the scientists who test on animals why they do it and their answer is: "Because the animals are like us." Ask them why it is morally OK to experiment on animals, and their answer is: "Because the animals are not like us." 21. "A customer was complaining that it smelled like something died over in the meat department." 22. "When a man wants to kill a tiger for fun, he calls it "sport", but if the tiger kills him in self defense it is called "ferocity"." 23. "Over 100 million sharks die at the hands of humans each year, while only 25 people a year die from shark attacks!" 24. "Why does Sea World have a seafood restaurant? I'm halfway through my fish sandwich and I just realized, "Oh my God, I could be eating a slow learner!" 25. "Animal rights has never been about equal rights. A chicken does not need the right to vote, but perhaps should have the right to spread her wings, which is a right that is not applicable to humans." 26. "When you go vegan you give nothing up. You simply stop taking that which was never yours to begin with." 27. "Imagine if you discovered that your employer was planning to kill you as soon as you reached retirement age so that they wouldn't have to pay your retirement checks. Would learning that they planned on killing you "humanely" make it OK with you?" 28. "Life is too short to make others shorter." 29. "People often say that humans have always eaten animals, as if this is justification for continuing the practice. According to this logic, we should not try to prevent people from murdering other people, since this has also been done since the earliest of recorded times." 30. "Animals were not made for humans any more than blacks were made for whites, or women were made for men." 31. "The human body has no more need for cow milk than it does for dog milk, horse milk, or giraffe milk." 32. "I was so moved by the intelligence, sense of fun, and personalities of the animals who I worked with on the set of the movie "Babe" that by the end of the film I was a vegetarian." 33. "When I was poor and living in a garage in Kansas I began to draw the mice who scampered over my desk, and that is how "Mickey Mouse" was born." 34. "Be kind to every kind." 35. "The idea that some lives matter less than others is the root of all that is wrong with the world." 36. "We are quite literally gambling with the future of our planet for the sake of hamburgers." 37. "I could never go vegan." - Almost every vegan at some point before they became vegan. 38. "My only regret about going vegan is that I didn't do it sooner." - Almost every vegan at some point after they became vegan. 39. "People are more afraid of terrorists than they are of bacon and I want to tell them, "You do realize which one is more likely to kill you right?" 40. "During the last 80 years scientists have come up with almost 1,000 ways of causing cancer in mice, but still no cure for humans!" 41. "We have enslaved the rest of the animal creation, and have treated our distant cousins in fur and feathers so badly that beyond a doubt, if the animals were able to formulate a religion, they would depict the Devil in human form." 42. "We kill billions of animals, destroy the rain forest, poison the environment, and sell you products that are killing you. Thank you for your financial support!" 43. "Never be afraid to do what is right. (Especially if the well-being of a person or animal is at stake.) Society's punishments are small compared to the wounds we inflict on our soul when we choose to look the other way." - King, Martin Luther Jr.
44. "Animals go into the slaughterhouse alive and come out chopped into pieces, and people like to think something "humane" happens along the way." 45. "When an innocent man gets accused of murder his friends and family will often defend him by telling everyone that he couldn't have done it because he is the type of person who wouldn't even hurt a fly, and I encourage you to stop and think about that for a moment." 46. "Animals owe us nothing, but we owe them everything because we have destroyed their habitats, their families, and their personalities." 47. "Some people claim that vegan food is expensive without taking into account that meat costs the animals their life." 48. "Needless to say, jamming deformed, drugged, and over-stressed birds together in a filthy waste-covered cage is not very healthy." 49. "Compassion for animals is intimately associated with goodness of character, and it may be confidently asserted that he who is cruel to animals cannot be a good man." 50. "The idea that it is funny to see wild animals coerced into acting like clumsy humans, or thrilling to see powerful beasts reduced to cringing cowards by a whip cracking trainer is primitive and medieval." 51. "To get a feel for fur simply slam your fingers in a car door and you will experience a small fraction of the pain that fur-bearing animals feel when they get caught in the sharp metal fur traps." 52. "Natural meat eaters eat the eyes, the bones, and the blood of their prey, and we complain if there's a hair in our food???" 53. "Those who wish to have exotic animals as pets "love" them, but those who allow them to live in the wild where they belong love them far more." 54. "The most violent weapon on Earth is the table fork." 55. "Fur coats used to turn heads, now they turns stomachs." 56. "Cruelty to animals is one of the top 3 warning signs that a child will grow up to be a serial killer." 57. "Could you look an animal in the eyes and say to it, "My appetite is more important than your suffering?." 58. "Don't believe the cartoon drawing of a happy smiling cow on a milk carton. If the dairy cow's life was put into a book it would be a horror novel!" 59. "The human body has absolutely no requirement for animal flesh. Nobody has ever been found face-down 20 yards from "Burger King" because they couldn't get their Whopper in time." 60. "McDonald's has been getting criticized for the inhumane treatment of their cows. What they do is they fatten them up and then they kill them. You know, the same thing that they do to their customers." 61. "If you think that being hung upside down and having your throat cut while you are still alive and bleeding to death is a "humane" way to die make sure to let your family and friends know that's how you'd like to go." - Animal Rights Activist "Victoria"
62. "Hunting would only be a fair sport if the animals had guns too." 63. "I really don't want to look at dead animal parts while I'm eating." 64. "If slaugher was really "humane" it would be the farmers shring footage of it, not the animal rights activists." 65. "If you support an industry that slaughters over 100 billion animals a year, then in what sense are you an "Animal Lover"?" 66. "Where do I get my protein? The same place your "protein" gets theirs." 67. "People don't want to think about the fact that there's a victim involved in their choice to eat meat and that animals have to endure a horrific life and death for it, so they try to make themselves out to be the victim by saying that if they stopped eating meat they could never eat bacon again or they would have to eat "Veggie burgers"." 68. "In the meat industry "Awareness" is bad for business, "Sensitivity" is bad for business, and "Compassion" is bad for business. "Denial" however, the meat business finds indispensable." 69. "I have no doubt that it is a part of the destiny of the human race, in its gradual improvement, to leave off eating animals, as surely as the savage tribes left off eating each other once they came in contact with the more civilized." 70. "Back when I was eating meat every day if I didn't have caffeine in the morning I would start the day looking and moving like the meat eating zombies in horror movies." 71. "People eat meat and think that it will make them as strong as an ox, forgetting that the ox eats grass." 72. "After you have witnessed what goes on in slaughterhouses you can no longer look at a piece of steak, and simply think "yum"." 73. "Animal lovin' ain't shovin' em in the oven." 74. "You do realize don't you that by arguing against veganism and animal rights you are arguing for animal cruelty to continue?" 75. "The meat industry has the highest rate of employee injury and illness in the manufacturing sector." 76. "When you feel the suffering of every living thing in your heart, that is consciousness." 77. "You're not "dying for a cheeseburger", a cow is." 78. "The love for all living creatures is the most noble attribute of man." 79. "Someone asked me, "How's your rabbit food?" so I said, "Good, How's your vulture food?" 80. "Put a baby in a crib with an apple and a rabbit, and if the baby eats the rabbit and plays with the apple, I'll buy you a new car." 81. "Petting a dog while eating another animal is some weird stuff." 82. "The question is not, Can they reason? nor, Can they talk? But, Can they suffer?" 83. "It often happens that a man develops a deeper love and friendship with his pet cat or dog than he does with most of the other people in his life." 84. "My body is a temple, not a tomb"
85. "As long as there are slaughterhouses, there will be battlefields." 86. "150 years ago they would have thought you were absurd if you advocated for the end of slavery. 100 years ago they would have laughed at you for suggesting that women should have the right to vote. 50 years ago they would object to the idea of African Americans receiving equal rights under the law. 25 years ago they would have called you a pervert if you advocated for gay rights. They laugh at us now for suggesting that animal slavery be ended. Someday they won't be laughing." 87. "If humans killed each other at the same rate that we kill animals the human race would be extinct in only 17 days!" 88. "Apparently being a vegan raises your chances of someday being stranded on a deserted island with a cow and nothing else to eat by 10,000%." 89. "If humans ever got together globally in world peace and shared a meal together, you do realize that it would have to be a vegan meal. Why? Because Americans don't eat dogs, cats, and horses, Muslims don't eat pork, Indians don't eat cows, Buddhists don't eat poultry, etc. So the only meal that all nations could agree upon would be a vegan one." 90. "Some people believe that fish don't feel pain, but when you pull a fish out of the water you get the same exact frantic struggle to survive that you do if you push a human underwater." 91. 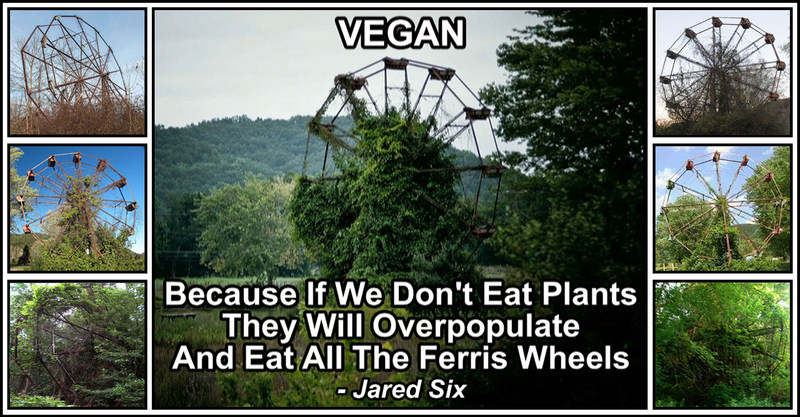 "A meat-eating environmentalist is an oxymoron." 92. "If you think that eating meat is a personal choice you are forgetting someone." 93. "When I became a vegetarian meat eaters asked me, "Where will you get your protein?" Later in life when I became a vegan vegetarians asked me, "Where will you get your protein?" And when I decided to become a raw foodist vegans asked me, "Where will you get your protein?" 94. "Give a man a fish and he'll eat for a day, teach a man how to fish and the ocean will go extinct by 2050." 95. "World Peace begins on your plate." 96. "If you don't want to be imprisoned, tortured, and killed for no reason then you shouldn't condone it happening to anyone, be they human or not." 97. "Suffering is suffering, and a person with the capacity but not the inclination to cease suffering is morally incomplete." 98. "Meat and dairy products are like one cent coins. They cost more to make than they are worth." 99. "Sometimes people will say things like, "I'd go vegan but I could never give up cheese". So I tell them, "Then go vegan except for cheese!"